All the theoretical physicists around the world are looking for the Grand Unification Theory. 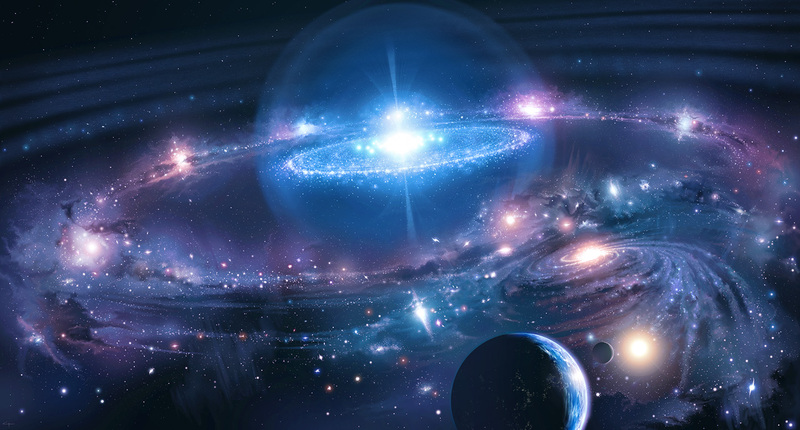 A theory that incorporates everything in the universe including the universe itself. The four forces in nature are all that make up this universe or rather I should say that universe which can be observed. Definitely we haven’t seen the edge. Neither we have found any center. On the other hand our universe is so big that by laws of mathematics, which we have devised, we are at the center. Thus all the theories and the calculations we have done cannot be imposed on that part of the universe that we haven’t observed. We may ourselves be an exceptional part in the universe where the value of Planck’s constant is what it is. This is pure imagination but, according to quantum physics, a valid one. The constant will have multiple Eigen value states until and unless it is actually observed. So there is always a possibility that we would not be able to imagine what is beyond the observable boundaries like the experiment with Schrodinger’s cat. So here’s, what I should say, an extended version of what you all know. Everything that we see is a result of some kind of initiation. This may be somewhat opposite thought to those who believe in coincidences. But actually, if observed carefully, coincidences are merely the happening of two or more events simultaneously. It is the nature of human mind to find the relation between two events that it observes simultaneously. Consider a small accident happening. A car hits a truck and loses its rear view mirror. Obviously, the two drivers first come out to check the damage, if any done, to their respective vehicles. The car driver sees that he has lost a rear view mirror and starts yelling at the truck driver. The truck driver doesn’t thinks that it was his mistake. The observers around see the broken mirror and start creating their views about the accident. Each of them has a different theory. Some would say that the truck should have stopped because there was traffic. Some would say the car was speeding and they thank God that no one is hurt. Some would say the car driver is drunk and that’s why he is wasting his time and energy for such a small damage what could have been a big one. Some would say it was just a coincidence. There can be a correct theory. But the coincidence is that the car and the truck came in contact with each other. So the observers make their theories and name them as coincidences. For eg. An observer who observed the car before collision would say that the car driver is to blame that he was speeding. It was a coincidence that the truck took the car’s rear view mirror. Hence, everything has an initiation, we just name it coincidence. The world has been chaotic in some or the other point in time. Consider the above example again. The car hits the truck. So everything around it changes. If the car had not hit the truck, everyone would continue their work as planned. The truck would have safely crossed a road. The drivers would not have got out of their vehicles. All the observing people would not be observers at all. Of course I am taking the collision as the initiation. The initiation was followed by the chaos by the immediately above assumptions not happening. Everyone came out of the order they were meant to remain in. In the same example, eventually everyone has to go to work or home or any place they want to. So they move away from the site of accident. The two drivers take their vehicles out of the way due to honking of oncoming traffic and the road becomes busy again. But here the order is created due to initiation of some other kind(like the honking). Hence if observed carefully, everything in the world has an initiation and then go into chaos and then reorder. This was also happening at the time the ‘ Time ‘ started. And it is happening to this very day. The chaos and the reorder become the initiation of other processes thus making the nested cycle of themselves. Posted on January 22, 2012, in Books, Odd Stuff, Philosophy, Science, Uncategorized, Words of Wisdom and tagged accident, broken mirror, chaos, cycle, eigen value, forces in nature, God, grand unification theory, grand unified theory, GUT, initiation, mathematics, philosophy, physics, planck s constant, quantum physics, rear view mirror, reorder, start, steps, the big bang, theoretical physicists, theory, time, universe, world. Bookmark the permalink. Leave a comment.